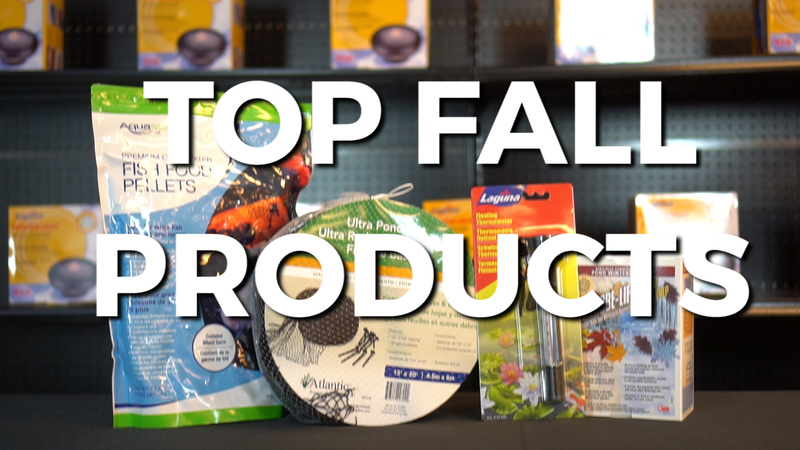 Top Fall Products Here are the top products this fall from Webb's Water Gardens! Atlantic Ultra Pond Netting: Catch leaves before they fall into the pond with Atlantic’s Ultra Pond Netting. Constructed of a heavy-duty, UV resistant woven polypropylene- these nets will last for years. The ½" x ½" opening keeps debris out while allowing sunlight and fresh air in. Each net includes ground stakes, and are available in 4 different sizes. Laguna Thermometer: Knowing your water temperature is extremely important when it comes to changing your fishes diet in the fall as well as treating with bacteria. To treat accordingly, you will to need a thermometer. Pick one up, they are fairly inexpensive. Aquascape Premium Cold-Water Fish Food: Speaking of food - when water temperature drops to 55 degrees, you’ll want to switch over feeding to a cold-weather food. Aquascape Premium Cold-Water Food is an easily digestible floating wheatgerm food scientifically formulated for colder water temperatures. These pellets include stabilized multivitamins and will not break apart and cloud the pond. Microbe-Lift Autumn/Winter Prep: Microbe-Lift Autumn/Winter Prep is a cold-weather bacteria that helps accelerate the decomposition of leaves and other organics during the fall and winter months. It’s a two-part system of liquid bacteria and dry, water soluble packets containing a blend of cellulase enzymes and bacteria. Use during this season to jump start your pond to a healthier environment come spring. For additional information on all our seasonal products, please don’t hesitate to call. I’m Joe from webbsonline. This vacuum is a workhorse, but will require a small amount of patience due to an auto fill and drain cycle, or on/off cycle.